injustice from around the world. Pro Bono Speaks is an interpretation and translation agency that gives a voice to survivors of torture and injustice from around the world. We believe that every man, woman, and child seeking asylum, relief from child abuse, domestic violence, and human trafficking deserves to tell their story in a language that others can understand. This is the first step in enabling survivors to receive the help they need to rebuild their lives. Many will seek asylum, and their ability to speak about their past enables them to receive assistance from law firms and human rights organizations in preparing their bids for permanent legal status in the United States. Sarah Williams founded Pro Bono Speaks in 2012 upon realizing the need for an interpretation and translation agency that specializes in sensitive casework. Today, Pro Bono Speaks works with more than 15 international law firms, numerous human rights organizations and health clinics, and individuals requiring top linguists to assist them and their clients. For every $1 of interpretation and translation services, Pro Bono Speaks donates 10 cents to raise funds to reunite asylees with their families. Crucia is a single parent who lost his four sisters, his son’s mother and years later, his daughter’s mother, as a repercussion of standing up for his beliefs. 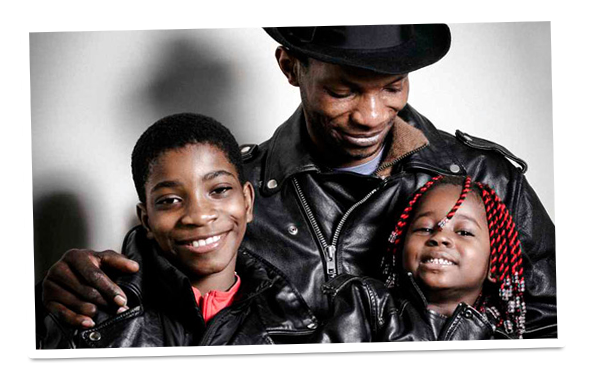 Thanks to the pro bono work of a law firm, he was granted asylum and his children were approved to join him here. Our partners are daily representing others like Crucia, who have fled with nothing but their lives. When Crucia’s children arrived, they had no belongings. Crucia’s employer had just downsized and he was without a job. That evening, Sarah mentioned his situation to a New York couple. Inspired to help, they gathered $1000 among their friends so Crucia could buy shoes and clothing for his children. When Crucia received the check, he was speechless. It was the first gift he had ever received. Every day, our team of 80+ interpreters and translators supports law firms and human rights organizations in their pro bono work. Our interpreters specialize in sensitive cases and are hand-picked to meet their specific needs. We're based in New York, NY, and work across the United States. We’re building a community of volunteers to help asylees get started in the US. Everyone has knowledge, networks, and skills that can jumpstart an asylee’s new life! We’ll match your resources to an asylee in need. We're excited that you're interested in volunteering! Let us know more about your area(s) of expertise so that we can start to discuss how you can contribute. We'll be in touch within twelve hours! Relocating is a financial as well as emotional challenge. Help asylees by raising funds for flights, DNA tests, and other practical needs. Also learn how you and your friends can reunite asylees with their families. Your support will make a tremendous difference in the lives of asylees and their families! New needs arise daily, and we'd love for you to partner with us, on your own or as a part of a group, to meet them. Recent contributions include: clothing for a six-year-old girl, funds for a DNA test for a woman from Guinea, a flight for a child from the Republic of Congo. Oftentimes, asylees' families are in danger in their home countries. We can fly them to safety in the United States and reunite loved ones by covering the cost of airfare. Your generosity enables all of this and more. Please let us know how and what amount you'd like to donate. We will respond within twelve hours to discuss asylees' current needs and determine the next steps!